Welcome to Wildflower Wednesday and a celebration of wildflowers and the pollinators they support. A very long time ago, I was almost undone by the conditions at Clay and Limestone! Even in the face of over whelming evidence that wildflowers naturally occurred and thrived here, I tried to create the gardens I had seen in books and magazines. They were all failures. The garden conditions they needed did not exist on my patch of suburbia with its shallow, poorly draining, nearly neutral clay soil. Once I realized my garden was a Central Basin plant community with plants native to cedar glades and the adjacent oak-hickory-red cedar forests, everything fell into place. I committed to gardening where I lived. I knew that in order to have a garden that was beautiful and thrived, I was going to have to plant more native plants. I learned as much as I could about them, located plant nurseries and built my garden~plant by plant. It's a never ending process. I plant natives because it makes sense. Central Basin plants are able to survive our extreme weather, tolerate our shallow clay soil that’s sticky gooey in the early spring and dry as concrete all summer long, and, support wildlife. They're gorgeous, too. My hope is that photos of C and L's wildflowers and the stories of my journey will spark your interest in native plants and gardening with wildlife in mind. Without further ado~Here are a few native plants that I captured with a pollinator or two. Welcome to Clay and Limestone's Wildflower Wednesday celebration. I am so glad you stopped by. WW is about sharing and celebrating wildflowers from all over this great big, beautiful world. Join us on the fourth Wednesday of each month. Remember, it doesn't matter if they are in bloom or not; and, it doesn't matter if we all share the same plants. It's all about celebrating wildflowers. Please leave a comment when you add your url to Mr Linky. Gail, your photos are exceptional. In the first one the bee appears to be looking directly into the camera while supping on the flower. Love this series. Happy WW. Whoops, sorry, twice was not supposed to happen. I am not looking for double coverage, Gail. LOL. My comment disappeared the first time I submitted, so I thought so did my link. Dear Gail, Your photos just get more beautiful each time! Indeed you are an inspiration for native beauty . . . flora and fauna . . . and learning more. Stunning post! Oooh, what a pretty bellflower Gail! 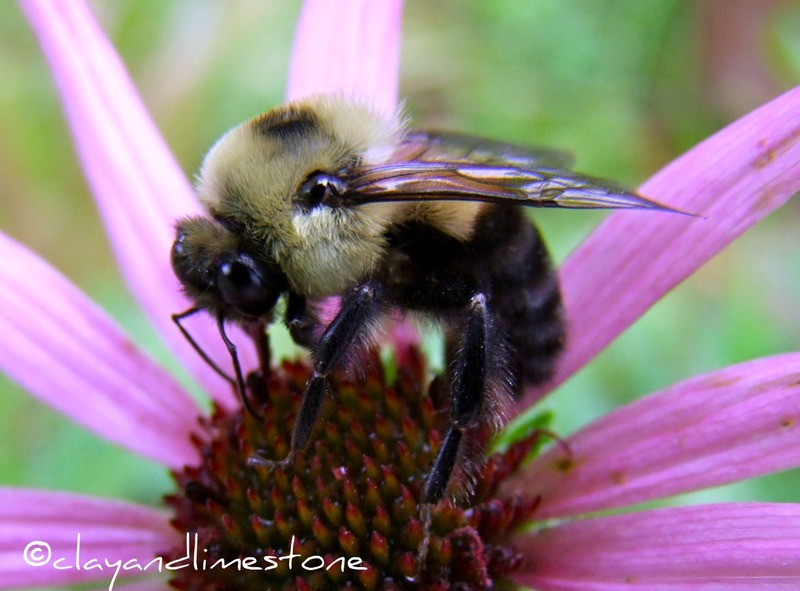 Pollinators must come from miles around to visit all your wonderful wildflowers. Isn't Herbstsonne rudbeckia wonderful! It competes only with Joe Pye for height in our garden, and I'm so glad I let a nursery owner talk me into a few of his several years ago. Even with only about three hours of sun a day, they bloom fantastically here. I'm looking forward to seeing them, and the pollinators they attract, in a few more weeks. Visiting your Zone 7 garden is like a preview of coming attractions in ours! Your advocacy for native plants and pollinators makes a difference in the world - kudos! Oh dear, oh dear, I've done it again! I was thinking WW was next (put italics there) Wednesday:( I just posted yesterday on another topic, but I'll join in on the fun in a day or two. Looks like a pollinator party at your house, Gail; it almost makes me want to boogie a little myself:) Fantastic photos--love the butterfly on the liatris. You may have poorly drained clay soil, Gail, but you have certainly made the most of it and created a wonderful garden for all to enjoy. Wonderful photos. I've added some wildflower images that I captured on a walk down by the bay last weekend. Patsi gave me a hint to make my photos larger... but it didn't work. I "stretch" them while I'm posting. More work. Any hints for me? Great shots Gail! Not sure if the bee on the Hydrangea will be able to take off with that pollen load. Happy Wildflower Wednesday. Shady/Kathy, 1. At the right hand corner of your blog page, you'll see a your gmail address, New Post, Design and Sign Out. Click on Design. On the left of the page~Look for Template Designer, click on it. Then you can go to Advanced to find Adjust width. You may have to move to a new template, but, that is so easy to do. But, in Adjust widths you can try out all the different widths to find the one you want. 2. I always use blogger in draft to write my blog posts~it allows one to choose photo sizes. 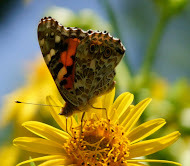 Your garden sure attract a lot of pollinators and your photos are superb! WOWZA! Lovin' these close-ups. Such great pics. I saw a number of wildflowers on our horsie ride yesterday, must remember to participate in your cool meme... This week, I'll just enjoy all of these gorgeous native flowers. Happy WW Gail!! I added my WW post to your linky. It's a good thing I put my post together a few days ago, I tried to add one last photo this morning, and Blogger won't let me. These are great pictures of pollinators. With my point and shoot, I can never get close enough for such good detail. Love, love, love your theory. If more people embraced "gardening for their site" they would not get discouraged. I am still learning about my soil (very wonderful loamy topsoil for 6" then solid limestone and about 75% shade)... still in some trial and error phases. I am trying to take what was here naturally and learn from it, we have different plant "communities" on our site. So every garden on the property is going to be different. Gail, just bee-utiful! This is a terrific exercise - both the walking through the woods, and finding out what's there. Love to see all the pollinators in your garden. It is inspirational! One of my favourite posts of the month. 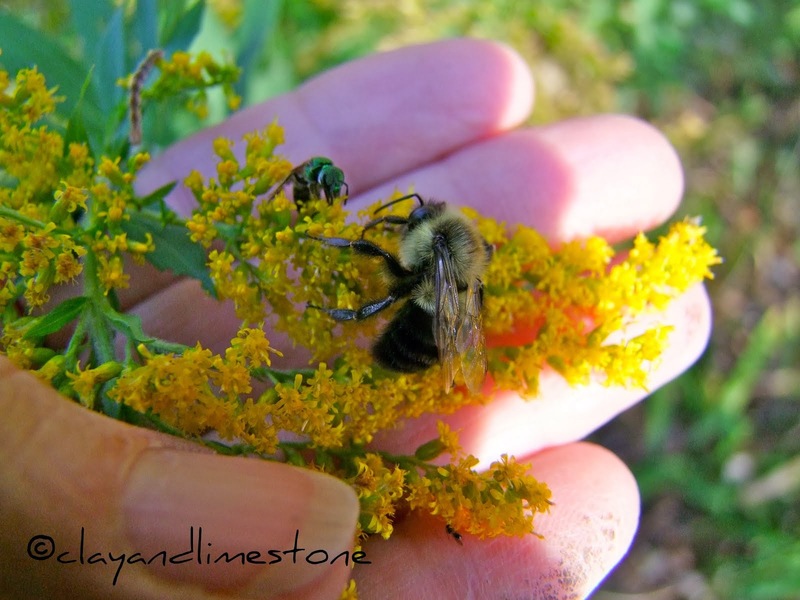 I always look forward to your amazing photos of bees and information on native plants. Lovely flowers and pollinators! I'm sorry I had to miss my WW post this month...work and rainy weather got in the way. You take such great pictures of your pollinators. You're wise to have figured out what your garden wants to go and then run with it. The plants are happy, the pollinators are happy, and you're happy. I was planning on visiting your blog, because I wanted to see if you had any suggestions for how to lay out wildflowers for my site so it looks natural, and actually came here, but got sidetracked. Thanks for the grass suggestions. I am planning on going to a plant sale at our arboretum Friday. They had several panicums on the plant list, such as Prairie Wind, Dallas Blues, Shenandoa, and Northwind. I looked them up, and think I like Northwind the best. It doesn't seem to get quite as tall or spread as far as the others. I also want to get Rudbeckia Maxima, but on their list, it says it's not native. Have you grown that before? I have seen it growing here, and love it! I enjoyed your post, and reading about the critters experiences with them. The photos were spectacular! Oh, and I went to a local hardware store because I remembered they had some grey headed coneflowers, and wanted to see what grasses they had. I got a couple clumps of blue fescue, then looked and saw that's not what you had recommended. I already have a clump of a short grass that I have never divided. It may be the same thing I got this evening. I pulled a liatris out of it, and got a piece of it. I planted it, and it seems to be doing OK. I may put some of those around, too. I think I'm going to take the 2 millet plants out and put them in a pot. They were supposed to get over 5 feet tall, but they are starting to bloom at 2 feet or so. I think I'll put the 'Northwind' grasses in those spots, and plant medium sized plants around them. Actually, there are aleady perennial wildflowers and/or natives near them that are supposed to get over 3 feet tall when they mature. People have been telling me not to be so hard on myself. It's not me I'm being hard on. I"m just deciding I don't like some of the choices I made quickly just to have some flowers this year. I am thinking I want this to be almost a meadow, if that makes any sense. Some of the plants need more water than others, and I have 2 spots for those. Your photos are splendid! Thank you very much for hosting Wildflower Wednesday. I am begining to appreciate all the lovely wildflowers we have here. I'm a day late, but I wrote a short post on what's blooming in (and flying over) the meadow this time of year. What's Campanulastrum? I have to look that one up. I think I like the photo of the skipper in the Stokesia best. It reminds me of a cup and saucer - perfectly matched. I think that you and I have the same sort of soil. I am so impressed with what you have grown in yours. Your photography is gorgeous and I love all the pollinators you have captured. This is my first time to join you, thank you for having me. Don't fight the site is a mantra you have well learned. Loved your pictures! Looks like our little friends are still at it. Beautiful blooms. I have all the same plants in my garden!! I also got tired of fighting with my clay and went native a while back. It just made sense! Ruellia hummilis, ruellia macropelata, and dalea purpurea should also do well for you.